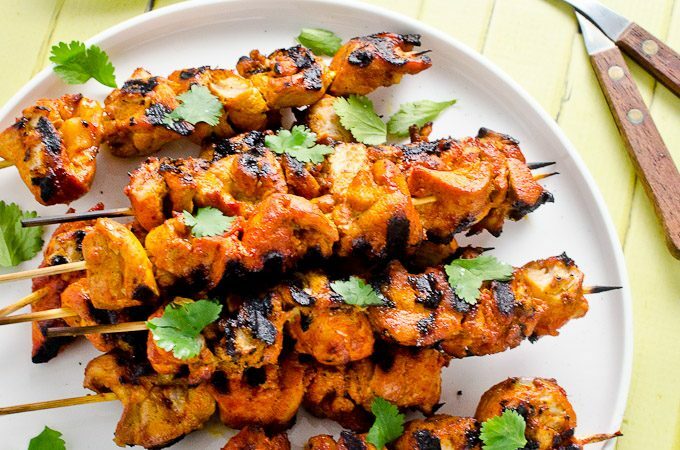 These delicious Thai Chicken Kebabs are the perfect BBQ dinner recipe. They're served with a spicy satay sauce that can be made with either peanut butter or (for a paleo-friendly recipe) with almond butter. They're an easy and healthy summer recipe. Chowing down on Thai chicken kebabs make me feel like summer has arrived! And … it almost has. I spent yesterday laying on the beach with my handsome man soaking up some much-needed sunshine. Today I keep getting distracted by the wicked new colour of my skin. Seriously guys, having a tan makes me so happy. You know what else makes me happy? Dipping some tasty Thai chicken kebabs into spicy satay sauce. Maybe this sounds cheesy but I've always loved food that has to be dipped. No matter what it is, that little plunge into something saucy just makes my day. The chicken is marinated in some simple but flavourful Thai spices before it's popped on the BBQ and covered in tasty grill marks. Then there's the cool cucumber salad. It's so simple that I was hesitant to share the recipe with you. Can I even call it a recipe when it only has five ingredients, including salt and pepper? Even though it's super basic I absolutely love it with the spicy Thai chicken kebabs. It's just a bonus that it can be made in less time than it takes the chicken to cook. The other big bonus: this whole dinner comes together in 30 minutes flat! Seriously, you can start this dinner and be sitting down to eat a half hour later. That's faster than it takes for pizza to arrive. And healthier. And 1.987 million times tastier. IMO. See that cucumber salad in the background photobombing the Thai chicken kebabs? I've been making that salad since I was about eight years old. No lie. My mom taught me how to make it and for years it would be my contribution to BBQs and picnics. Then after too many childhood cucumber salads it fell off my radar and was completely forgotten about, until a month ago. I knew I wanted to share this Thai chicken recipe with you, but I wanted to make it a meal. I don't know why or how this long forgotten cucumber salad recipe came screaming back into my brain, but it did. And it works! The truth is, I've been making this with so many meals again cause it's super stinkin' easy make, it's so tasty and it goes with just about everything. Hope you love it too! PS. If you're looking for more chicken recipes, make sure to check out the Meat and Chicken category. I love seeing the pics you take of the recipes on The Endless Meal. If you make these Thai Chicken Kebabs, make sure to snap a pic and tag #theendlessmeal on Instagram so I can like and comment on them! These Thai chicken kebabs are full of flavor and super tender. They're served with an easy to make satay sauce and a simple and delicious cucumber salad. Set 8 wooden skewers in water. Cut the chicken thighs into bite-sized pieces and put them in a resealable plastic bag. Mix the remaining ingredients together in a small bowl and pour them over the chicken. Seal the bag and squish it around a little so that all the chicken pieces are covered in the marinade. Let the chicken marinate for 15 minutes. While the chicken is marinating, oil and preheat the grill to high. After 15 minutes take the chicken pieces out of the marinade and thread them onto the soaked skewers. Grill the chicken for 5 minutes on each side, or until the chicken is no longer pink in the middle. Start the satay sauce while the chicken is marinating. Melt the coconut oil in a small pot over medium heat. Add the onion and sauté for 5 minutes, or until it is soft and translucent. Add the ginger and garlic and cook for 1 minute more. Add the coconut milk. soy sauce, lime juice, and peanut or almond butter. Let the sauce cook for 1 minute, or until it has thickened. If it thickens too much add a splash of water. In a medium sized bowl toss together the cucumber slices, red onion, mayonnaise, salt, and pepper. Serve the chicken on a platter with the satay sauce and cucumber salad on the side and let everyone dig in! i made this today. it was a hit. thanks for the recipe! I’m so happy to hear you liked the recipe! I made this tonight with cauliflower fried rice – it was a big hit! I love that it was fast to marinate and prepare and barely had any sugar. Great job! I’m so happy to heat you liked the recipe!! Made this delicious chicken on Monday and it was a hit. But what ingredient is missing from the satay sauce to make it spicy? It’s very tasty but not spicy at all. Chili paste perhaps? Thanks again for another great and easy recipe. Thai food is my fav, too! Ha ha double dipping’s where it’s at! How’s a person supposed to resist?! Great idea about the extra chilies. LOVE it hot hot hot! This looks incredible and I really like the 15 minute marinade. Love the spices and the satay sauce swap of utilizing almond butter sounds intriguing. Glad to have connected! Thank you so much, Kevin! So happy we connected too!! What a gorgeous post, Will be making my own twist tonight with pork! Thanks for the inspiration! Thanks, Deb! I think pork would be awesome cooked like this. Yum! Hi Kristen, I’m first time here and really loved your blog. You have great collection of recipe. Glad to found you! Now, I’ll spend sometime going thru your awesome recipe pictures. Have a great day! Thanks, Savita! Hope you have a great day too!! I LOVE Thai food! And I’m so jealous you’ve been laying on the beach and working on your tan! The closest beach for me is about… say… 500 miles away! Ha. I love the beach though. I’ve been using my grill more too now that we’re entering into warm weather, and I gotta give this recipe a try! (Especially that cucumber salad) This was my first time to your site, so glad I stopped by! That’s a heck of a long way to go to lie on the beach! When I was a kid, and the beach was a little further away, I used love laying on the grass in the backyard. Anything to feel the sun on me! Thanks for stoping by The Endless Meal!